Manning, C. (2014). Considering peer support for self-access learning. Studies in Self-Access Learning Journal, 5(1), 50-57. This paper briefly examines if and how peer support can be implemented as an appropriate means to improve self-access learning. The potential for further alignment with the higher aims common among self-access learning centers will be examined. Opportunities for increasing interdependence, purpose, and level of challenge to foster student engagement will also be explored. Finally, future directions in self-access learning will be discussed. ‘Peer support’ is a form of cooperative learning. It is a broad term used to describe a variety of more specific roles students may take on to enhance the learning of others, including, but not limited to, peer helping, facilitating, advising, instructing, aiding, assisting, and leading (Newton & Ender, 2010). Six years ago, the University of Shimane began developing a peer-support program to aid students who were struggling with English (Manning, 2013). Advanced students were trained to become peer facilitators and supported three to four lower-level students each. Positive feedback and significant improvements on tests stimulated the creation of similar programs to help incoming freshman students transition to university life more successfully. Again, these programs have yielded positive results. While these programs are much too large to be conducted within the University of Shimane’s small Language Learning Support Room, they align with the aims of the self-access learning center (SALC). If our SALC were larger, it would be an ideal place to host these small group study sessions. Recent inquiries from institutions with larger SALCs, considering the possibility of creating similar programs, led to a presentation at the Directions in Self-access Learning Symposium in October, 2013, and this corresponding paper. 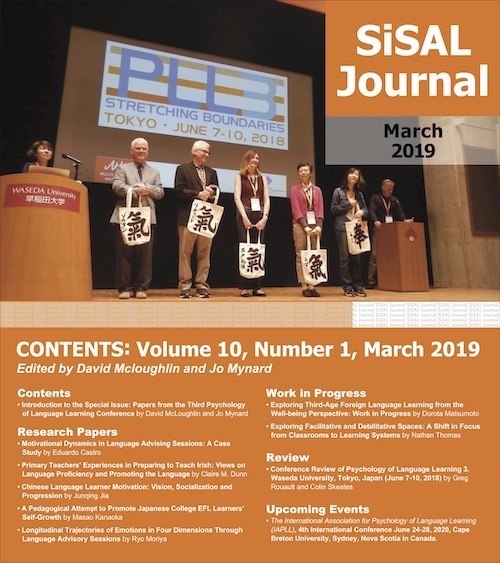 Rather than focusing on programs implemented at the University of Shimane, this paper aims to examine reasons why institutions might consider using some form of peer support to enhance student experiences and learning outcomes in their SALC. When considering a new educational program, alignment with larger institutional objectives is recommended as a first step (Ornstein & Hunkins, 1998). To achieve alignment with higher educational objectives, it is important that SALC services work to reach at least one desired outcome. Unsurprisingly, objectives vary with each university and their corresponding SALCs. Thus, SALC managers will need to determine what kind of peer support is most appropriate for their specific aims and context. The diversity and flexibility with which peer support can be designed and implemented make it worth considering for promoting more successful outcomes. “From a practical perspective, self-access provides support and opportunities for learning outside normal class hours, opportunities for target language practice, and study options to suit all learners” (J. Mynard, personal communication, September 30, 2013). The phrases “provide support and opportunities” and “study options to suit all learners” are particularly relevant when considering a peer-support system to improve self-access learning. In terms of support, students may feel more comfortable asking peers simple questions, thereby increasing the chances they will actively seek help. Also, peer supporters may often be easier to understand than teachers, especially when the teacher and student do not share the same first language. Plus, peers may be in a better position to identify and understand the other student’s situation (Lockspeiser, O’Sullivan, Teherani, & Muller, 2008). These factors provide more preferable study options for some students. As for opportunities, a teacher’s time to support students is limited due to many other responsibilities. However, peer supporters can supplement more traditional means of support, thereby increasing opportunities to learn. Promoting self-directed and autonomous learning are also important aims among many SALCs. Peer support should not be overlooked as a means to help achieve these aims. Autonomy may be associated with the image of working alone. However, Holec (1980) suggests learner autonomy can take different forms in different contexts. He describes autonomy as an individual’s ability to make decisions when determining objectives, defining the contents and progression, selecting methods and techniques to be used, monitoring the procedure of acquisition properly, and evaluating what has been acquired. None of these categories entail working alone. As such, providing opportunities for students to study interpedently can also foster learner autonomy. Students may desire the opportunity to join a positive and supportive, student-led study group. Student supporters could even be given specific training as peer advisors to help new students use the SALC more effectively in order to facilitate further autonomous learning. Interdependent learning may often be more effective than independent learning for encouraging sustained SALC usage. A study conducted by Hughes, Krug, and Vye (2012) reveals that the majority of students first sought out their SALC for learning purposes, but continued visiting for social reasons. This finding is consistent with my own independent research, which included interviews with our most frequent SALC visitors. In these interviews, all of the students described social reasons for visiting our Language Learning Support Room. In some cases, these increasingly social visits remained focused on learning, while others became less productive. Introducing a peer-support system is one way to encourage a maintained focus on learning while developing social relationships at the same time. Encouraging a supportive community within the student population has a large potential to benefit students, and as Mellanby, Rees, and Tripp (2000) point out, in many situations, peer influence may be stronger than that of adults, including teachers, parents, or other experts. Providing a meaningful role of support and training students to fill it may also be a motivational stimulant. Csikszentmihalyi (1990) suggests that people are happiest working on tasks while in a state between anxiety and boredom, which he calls flow. As a person’s skills increase, the level of challenge or difficulty must also increase to maintain a state of flow. If students do not have the skills or knowledge to complete difficult tasks, they may feel overwhelmed or anxious. On the other hand, if students have explored all a SALC has to offer, they may become bored. However, challenging advanced students to help others learn is an appropriate way to keep them in the flow state. This practice has the added benefit of reinforcing previously obtained knowledge or finding gaps in knowledge. Mynard and Almarzouqi (2006) also observed that peer tutors learned by teaching others, felt they had an opportunity to do something worthwhile, and became more responsible. Once students become skillful peer advisors, facilitators, or tutors, training and managing new supporters are further challenges to increase difficulty and protect motivation. Students are capable of fulfilling such roles. On almost every campus, students discuss which classes to take and occasionally help each other with homework. In this sense, every university already has an informal peer-support system. However, there are several reasons in favor of introducing a formal peer-support system. Trained peer educators are more effective, as untrained supporters have been shown to be less effective (Falchikov, 2001). For example, trained helpers are more likely to know how to respond to correct or incorrect answers in a manner that enhances student learning and motivation. They should also be more familiar with the learning material than someone without training. However, there are limitations to what a peer should be expected to do, and as Newton and Ender (2010) note, students can be trained to meet some needs, but others require additional support. Even formally trained peers should not be expected to be able to do everything. Creating a formal system of support, with appropriate roles and responsibilities distributed between students and teachers, can facilitate effective teamwork and help ensure that appropriate forms of support are being offered. This includes support for the trained peer helpers as well. To promote a positive experience for everyone, it is important for peer supporters to have access to help when faced with difficult questions or situations. Universities fortunate enough to have SALCs typically start out by providing resources for students. This may include access to materials or to native English speakers. If SALCs fossilize in this state, they could fail to develop beyond providing a somewhat static environment for learning, as the SALCs would not change in response to the students’ actions. Speculatively, encouraging students to interact and collaborate with each other in a learning-centered community of support could be an effective approach to make a SALC environment more dynamic. This could also generate opportunities for students to take on new challenges as their skills increase. It is certainly possible to imagine a SALC in which the students have a highly increased sense of ownership, participate in a meaningful community, and contribute to enhance the learning of others. In such an environment, change would be driven by the constantly shifting demands of helping each other learn more enjoyably and effectively. This would also provide new challenges for students to overcome, thereby boosting engagement. Plus, peer support includes the social and collaborative aspects that previously mentioned SALC research (Hughes et al., 2012) has shown to be desirable. Therefore, a peer-support program should theoretically increase SALC retention rates for prolonged usage. Students are one of the greatest resources in any given SALC, but unfortunately this resource remains largely untapped in many cases. Some administrators may hesitate to endorse action or provide funding because there is no guarantee that a peer-support program will be successful. Without deviating from the aims of this paper, it is worth briefly mentioning a few general guiding principles and recommended tools to greatly increase the chances of success. These ideas have been selected based on personal experience and may be especially useful for those who are drafting proposals for a new peer-support program or designing a pilot study. Maintain voluntary participation. It is always possible that there will be a few students who have a strong aversion to working in groups. To avoid creating negative experiences, make participation voluntary for students giving or receiving help. These five elements are interconnected. Ensuring that groups have a positive and productive start has a very large impact on the future of the program. Groups that begin without a clear purpose and lack of focus may have more difficulty learning effectively in later study sessions. The structuring of activities is influential because it can enable each member to have a distinct purpose and specific means to contribute to the group, which leads to positive interdependence. Creating positive interdependence can help keep the focus on learning, while allowing social elements to develop. Finally, to ensure that students are benefiting from the experience, individual accountability allows the progress of each student to be monitored for evaluation and self reflection. Each of the elements Olsen and Kagan (1992) suggest can be used together effectively to make learning more enjoyable and effective. One common problem, encountered by new participants in a peer-support program, is the lack of a clear initial image of what everyone should be doing. To overcome this problem, study sessions may be recorded and the footage used to provide examples for future participants. This form of near-peer role modeling (Murphey, 1998) can greatly clarify the roles and responsibilities for new participants, whether they will be providing or receiving help. It may also generate mutual expectations, which can prevent problems resulting from conflicting ideas about what should be done. To further develop mutual expectations and to monitor progress, parallel surveys following study sessions are recommended; one for the helper and one for the person receiving help. The surveys should include specific items describing sought-after behaviors. For example, on the tutors’ questionnaire, agree/disagree statements like, “Today, I helped students answer their own questions.” would correspond to similar questions on the tutees’ questionnaire, such as, “Today, I tried to answer my own questions.” This parallel survey system seems to influence mutual expectations, as changes in student behaviors have been observed immediately after the addition of new survey items. An open-ended question is also recommended to identify problems and things that are going well. For example, a student might complain that her tutor was chewing gum. On the other hand, another student might share that he was able to concentrate well during the study session. Sharing these comments with tutors may encourage them improve or continue trying hard. To implement the surveys, a QR code linked to google forms may be convenient. This system allows students to access the survey from a printed card, carried by helpers or posted in the study area, using their cell phones. Links on course websites are also a convenient means for implementing the surveys. This paper set out to examine why institutions might consider incorporating some form of peer support to enhance student experiences and learning outcomes in their SALCs. Working towards this aim, it was argued that peer support is likely to align well with the higher educational aims of a university and SALC. The literature was reviewed to show that formalizing peer support has the potential to be highly influential, beneficial, and motivational for students. Finally, a few practical suggestions were briefly provided as a starting point for those inspired to draft a proposal or pilot a new program. SALCs are relatively new to language learning, but some may already be at risk of fossilizing in a static state. The more successful SALCs will undoubtedly be the ones that are constantly evolving and improving. Peer support is a time-tested method with a strong research base demonstrating that it can be used effectively in a wide variety of contexts. Yet, peer support, as a means to enhance SALC outcomes within the field of language learning, is still in its infancy and in need of further research and development. As the research within this area grows, so will the effectiveness of such programs, helping students to reach their full potential. Craig Manning aims to inspire and empower students to make learning more enjoyable and effective. He is a lecturer at the University of Shimane with ten years of experience as an English language teacher. He has an M.A. in TEFL from the University of Birmingham. His current research interests include peer support and student motivation. Csikszentmihalyi, M. (1990). The psychology of optimal experience. New York, NY: Harper & Row. Falchikov, N. (2001). Learning together: Peer tutoring in higher education. New York, NY: Routledge Falmer. Holec, H. (1980). Autonomy in foreign language learning. Strasbourg, France: Council of Europe. Manning, C. (2013). Making an impact with peer tutoring. In N. Sonda & A. Krause (Eds. ), JALT2012 conference proceedings (pp. 186-193). Tokyo, Japan: JALT. Murphey, T. (1998). Motivating with near peer role models. In B. Visgatis (Ed. ), On JALT ’97: Trends and traditions: Proceedings of the JALT 1997 international conference on language teaching and learning (pp. 201–206). Tokyo, Japan: JALT. Newton, F., & Ender, S. (2010). Students helping students: A guide for peer educators on college campuses. San Francisco, CA: Jossey-Bass. Olsen, R., & Kagan, S. (1992). About cooperative learning. In C. Kessler (Ed. ), Cooperative language learning: A teacher’s resource book (pp. 1-30). Englewood Cliffs, NJ: Prentice Hall. Ornstein, A., & Hunkins, F. (1998). Curriculum foundations, principles, and issues (3rd ed.). Boston, MA: Allyn and Bacon.